The mattress stitch, also known as the invisible seam or invisible weaving, is a very flexible seam that works best for sewing garment pieces together because it makes for a flat, invisible seam. You always work this stitch with the right sides facing up so you can make sure the seam is invisible on its best side. The key to this stitch is to make small stitches, weaving your needle back and forth between the two pieces while working up the inside of the edges to be joined. Place the pieces to be joined on a flat table with the right sides facing you. With an 18-inch length of yarn (or the long tail end) threaded onto a yarn needle, insert the needle up through the bottom-most stitch of 1 piece and out the middle of the post, or turning chain, of the same stitch, as shown in part a. If you’re not using a tail end, leave a 6-inch tail with your first stitch so you can weave it in later. Insert your needle up through the corresponding stitch of the second piece and out the middle of the post, or turning chain, of the stitch, like in part b of the preceding image. If you aren’t using a secured tail end, weave the needle through the same stitches referenced in Steps 2 and 3 to secure the yarn. Insert your needle in the same spot where the last stitch came out on the opposite piece and bring it up and out the top of the double crochet stitch (dc), as in part a of this image. Joining the sides through the next 2 stitches. Pull the yarn to draw the 2 pieces together, but not so tight that the fabric puckers. Continue weaving your needle back and forth as you move up the inside edges, making 2 stitches along the post of each double crochet on each piece to be joined. Continuing to join the pieces with the mattress stitch. To fasten off, weave the yarn back and forth 1 more time through the last 2 stitches worked and cut the yarn, leaving a 6-inch tail for weaving in. The following figure presents you with two finished pieces joined with the mattress stitch. 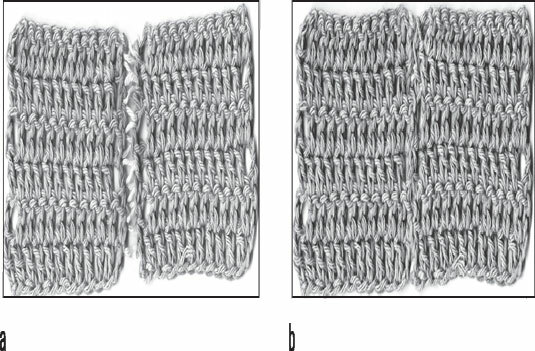 Part a shows the opened mattress stitch; Part b shows the complete, closed mattress stitch. The completed mattress stitch seam. You can work the mattress stitch to join pieces of any stitch height. 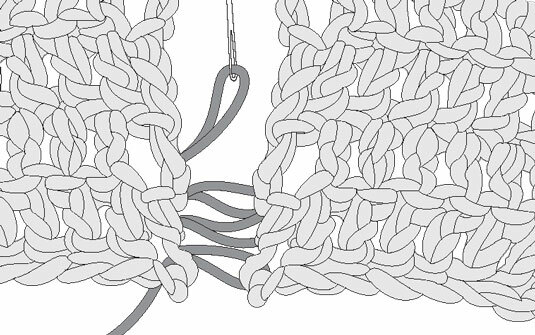 Just make sure you weave the yarn back and forth using evenly spaced stitches. For single crochet stitches, simply insert the needle through the bottom-most stitch and out the top of the same stitch; then do the same for the corresponding stitch on the second piece. For the next row, move up to the next stitch. For the triple crochet, weave the needle back and forth three times for each post before moving on to the next row. If you’re using the mattress stitch along the top loops of a row, simply follow the preceding steps for sewing the row ends; just be sure to keep your stitches short.